A simple but smart way to get dogs to slow down when eating. 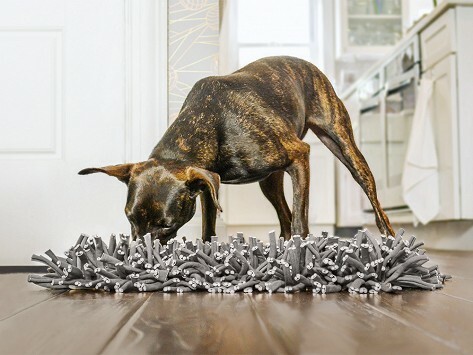 The Wooly™ Snuffle Mat triggers a dog's natural instinct to hunt and forage by making them search for dry food and treats. They're challenged, engaged, and they have fun. Looking a little funky? The mat is washing machine-friendly between meals. Good for all dog types and sizes, and sustainably handmade in Ghana. Dimensions: 12" x 18" x 3"
My pup always gobbled her food in one minute. This mat significantly slowed her down so that hopefully she'll remember that she has eaten!! An energetic new puppy inspired PAW5 Maker Dennis O'Donnell to create mealtime toys for dogs that make their everyday routine more engaging and more fun. He is following up his Rock 'N Bowl feeding puzzle with the Wooly™ Snuffle Mat. It takes a softer approach to getting dogs to slow down while eating. The shaggy mat triggers dogs' instincts to hunt and forage by making them do just that to find their dry food and treats in the mat. It works for all types and sizes of dogs and can go in the washing machine, too. PAW5 continues their commitment to sustainability that began with the Rock 'N Bowl. They partner with a woman-owned facility in Ghana to make the mats by hand by vulnerable women who receive a living wage for their work.